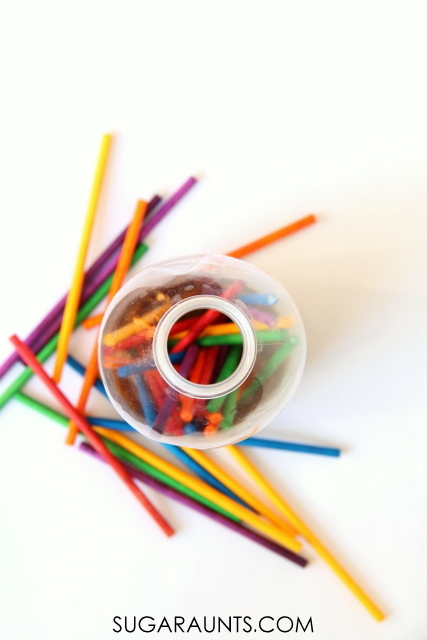 We made these dyed lollipop sticks last month and have been playing with them a lot. 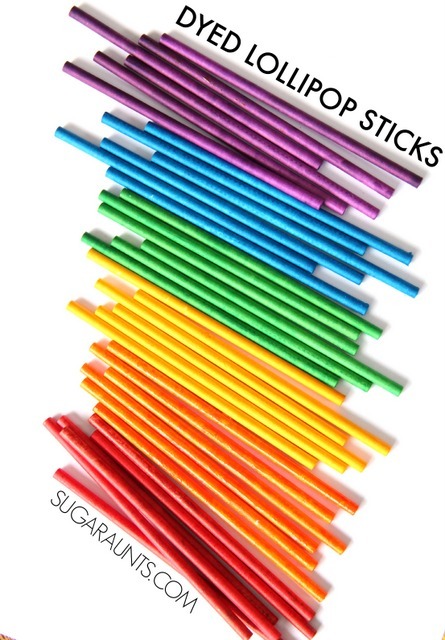 Counting, patterns, fine motor play, art, visual perceptual work, and imagination are fun with these colorful rainbow sticks. They are so easy to dye with just a little food coloring, and very fun. 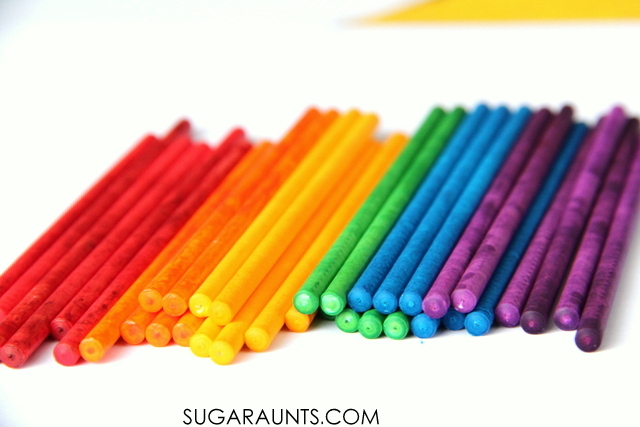 We've used these rainbow sticks in a few different ways recently and will be sharing soon on the blog! 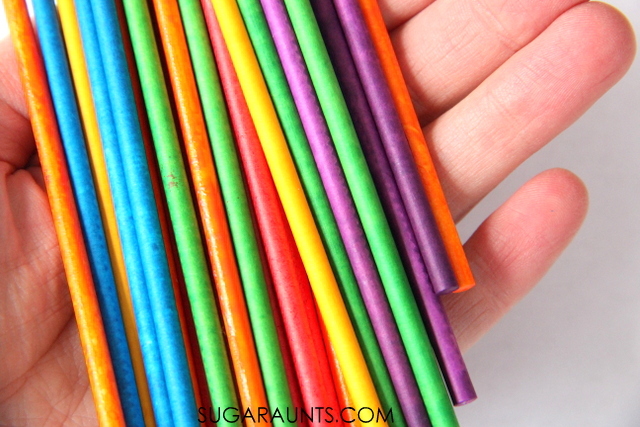 How gorgeous are rainbow lollipop sticks? Don't you want to play with them? We had a ton of extra lollipop sticks left over from various parties. The idea to color them in rainbow shades came to me after seeing them in the baking bin next to food coloring. 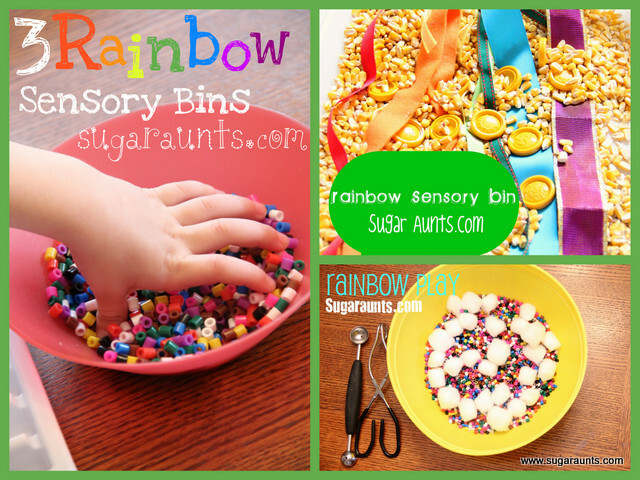 A rainbow of manipulatives would be fun for all kinds of play. I put a handful of sticks into small plastic baggies and added a few drops of liquid food coloring . More food coloring will bring out brighter colors. Shake the baggies around to coat the sticks. 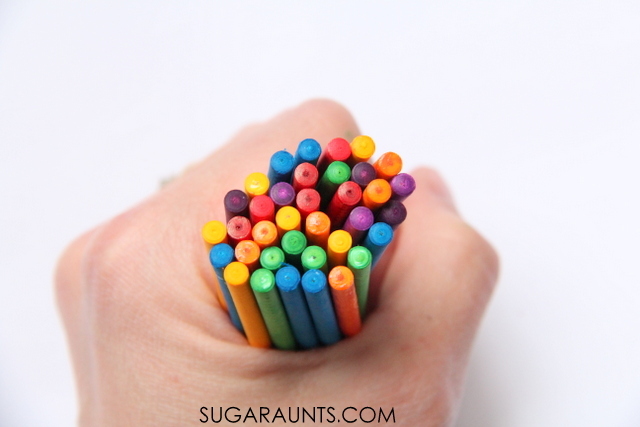 Spread the lollipop sticks out on wax paper and allow them to dry. Once dry, you are ready to play! These things are completely gorgeous and we had fun just naming all of the colors, rolling them back and forth, and sorting. We pulled a plastic bottle from the recycle bin and practiced fine motor skills by dropping the rainbow sticks into the plastic bottle one by one. Drop by colors and work on color identification. Practice beginner math skills by counting one-to-one correspondence as the child names the number of each color. 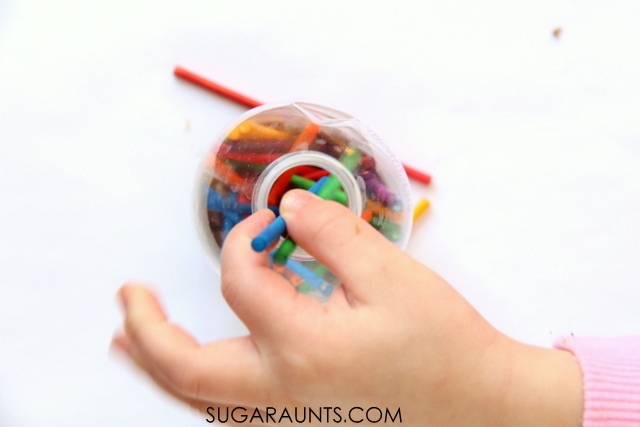 Practice a tripod grasp on the lollipop sticks and pre-handwriting skills. Fine motor rainbow play was never so much fun! 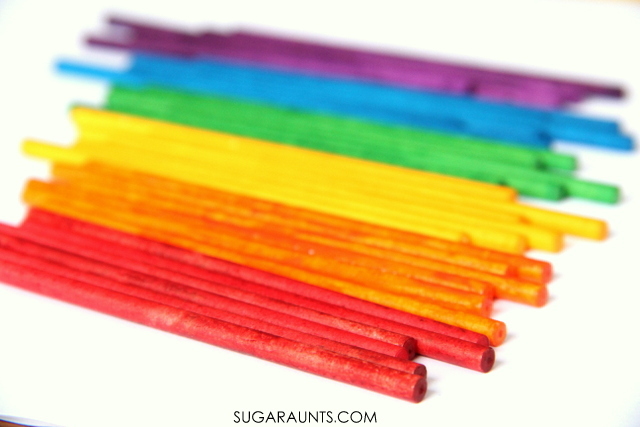 You can see another recent version of dyed lollipop sticks over at Stay at Home Educator. These are so much fun!